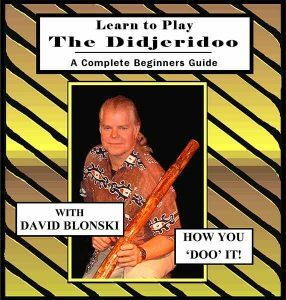 Though much of what you will do with the didgeridoo will result from your personal exploration and experimentation there are a few basic steps to learning to play the didgeridoo. You create the basic fundamental tone by buzzing the lips together similar to the way you would a trumpet but much looser and more relaxed,.. think Tuba. The result should be a low droning buzz that reverberates the whole instrument. When you can sustain a full bodied drone for several seconds you can experiment with changing the position of your tongue and changing the shape of your mouth in order to change the tonal qualities of the instrument. This is done much in the same way as you would shape vowel sounds, consonants, and even words. 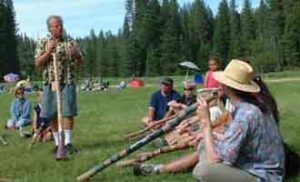 You can even vocalize into the instrument while you buzz your lips making it a bit like playing the kazoo. This free online introductory tutorial series will use MP3 sound files to demonstrate playing techniques. I have litteraly taught thousands of people to play the didgeridoo with this easy to use and understand system. The only thing better is being taught in person.